A spate of recent self-immolations and other anti-China protests have occurred in the western province. "We should resolutely crack down on separatist activities and crimes of all kinds, uphold state unification, ethnic unity and the normal legal order. This upholds the basic interests of the people and upholds their religious freedom,'' Mr Liu was quoted by the newspaper as saying. There have been at least 21 cases of Tibetan monks and nuns who have set themselves on fire over the past year to protest at Chinese rule in Tibet. The paper reports that Mr Liu visited the Buddhist Kirti monastery in Aba, which is under tight security. "Everyone is equal before the law. No matter whether you are a monk or a nun, you are a citizen first," the paper quoted him as saying. "There are no monasteries outside the law, nor are there individuals outside the law." He was also reported as saying that "there should be no reason to destroy an innocent life". Mr Liu also reportedly met security forces in the region during his visit. Correspondents say Tibetan-populated parts of China are experiencing their worst unrest since riots and protests were suppressed four years ago, with at least three deadly demonstrations reported in January. 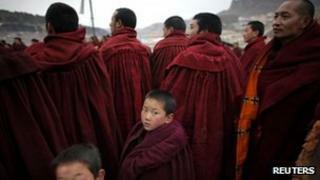 Tibet celebrated its new year on Wednesday. International media are denied access to the area, making it difficult to verify incidents that are reported.